The death of a child is certainly heartbreaking. It often makes for interesting memorials. Alice May Parker died in 1861 at age 12 of typhoid fever. 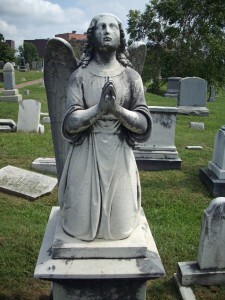 At Congressional Cemetery, a praying angel the size of a child prays over her grave. Nearby is a small lamb for infant John Walker Maury and a cherub named Florence. This entry was posted in Monuments and Statues and tagged Alice May Parker, Best Washington DC walking tours, Congressional Cemetery, Photo by Rick Snider, Washington D.C.. Bookmark the permalink.